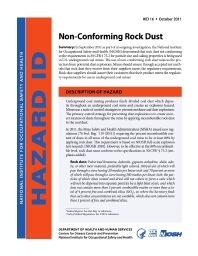 In September 2011 as part of an ongoing investigation, the National Institute for Occupational Safety and Health (NIOSH) determined that rock dust not conforming to the requirements in 30 CFR § 75.2 for particle size and caking properties is being used in U.S. underground coal mines. The use of non-conforming rock dust reduces the protection from potential dust explosions. Mines should ensure through accepted test methods that rock dust they receive from their suppliers meets the regulatory requirements. Rock dust suppliers should assure their customers that their product meets the regulatory requirements for use in underground coal mines.